Mezzanine floors are the perfect way to maximise storage space and enhance the productivity of your warehouse or storage facility. Many goods are better suited to manual handling as they come in shapes and sizes that cannot be palletised. 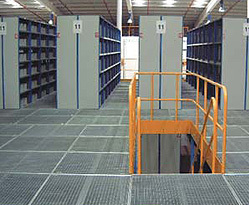 Longspan shelving is an economical, non-palletised storage system. It’s similar in construction to pallet racking but designed for specific applications to enhance storage areas for both commercial and industrial use. Both longspan and modular shelving systems (from ISS ProRack) can be designed in single or multi-tier for innovative warehouse/office storage solutions. Longspan beams are stepped to enable particle board, steel or mesh shelf inserts to fit flush with beams. The raised storage area system is available in single or multi-tier configurations (up to 4 tiers with mezzanine floors in between) and in high bay longspan (above 3m high) and clear entry longspan (from 1300mm to 27mm). To ensure you optimise your storage space and usability, check out our Design Services.